Found this browsing the issue of copyright laws, thought it made a good case for reception studies (tough in literature) and made a good case for the kind of document-based research that good reception studies should be about. 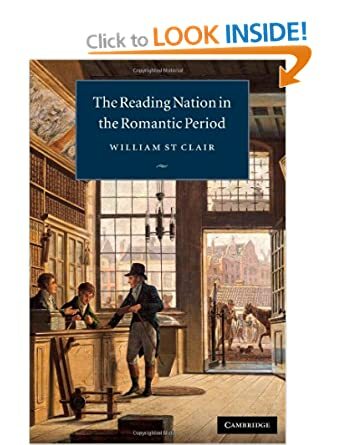 Let’s start by talking about your groundbreaking book The Reading Nation in the Romantic Period, which suggests that ordinary people may not have been reading what we think they were in the 18th and 19th centuries. Can you give us a brief summary of your findings? As I read the main books about Romantic literature, I was struck by the extent to which they tended to assume that the works which we most value nowadays were also those that were most valued in their own time. I began asking simple questions like “Who read Byron?” – questions that had seldom been addressed in the academic literature – and when the spadework was done, the answers turned out to be very different from the then received views, which were mainly derived from what past literary critics had written. I gradually began to build up a picture of which books were available to be read, in what quantities, at what prices and by what constituencies of readers, in the English-speaking world in the so-called Romantic period. These years – from around 1790 to 1830 – not only saw an astonishingly rapid expansion of reading, but political and economic upheaval, including the French and Industrial revolutions, and many other innovations in ways of thinking. I was also struck by the extent to which literary studies took the form of analyses of literary texts without being concerned with effects. Although I am all in favour of literary criticism, and of picking out and celebrating the best writing, my reaction was that we cannot assess the effects of the literature of the past, or of other writings, without information from outside the texts themselves. I worked for most of my professional life in the British Treasury, where the most important questions were to do with the real world effects of public policies and how these effects could be assessed and evaluated. So if there was a link between printed literature and wider effects – if literature was indeed as influential as is usually assumed – I thought it ought to be findable. My book involved searching for primary records in archives of publishers, printers, libraries, trade catalogues and auction sales of copyrights, in several countries. To my surprise they turned out to be astonishingly full, and arranging and summarising the information takes up a large part of the book. What I was trying to apply, and to get over to my readers – and it hasn’t been accepted as fully as I might have wished – is that the conclusions of my book arise from the data. I’m not putting forward arguments and backing them up with footnotes – I’m trying to apply the scientific paradigm of collecting all the relevant data, searching for emerging patterns, putting forward findings and new hypotheses and allowing and encouraging other people to see if they can replicate the results. Can you tell us more about the conclusions that you reach? I know that one of the notions you question is that the 19th century was the “golden age of Wordsworth”, as the hard data showed that not to be the case. The “age of Wordsworth” convention is a good example. The way literary history has been presented has been as a parade of the literary figures who are regarded as great now. Wordsworth is one. Blake, Shelley and Keats are others. But in their time these four authors were little read. Compared with Scott and Byron, the numbers are tiny. What also comes out strongly is that people didn’t just read the books first published in their times. In fact, most of the books being read in the Romantic period were written at least a generation or two before, and cannot by any stretch be regarded as romantic. And this mismatch comes to the fore when you try to look at the mentalities that might be expected as the result of the actual reading. Many people in the Romantic period are stuck in a pre-Enlightenment, pre-modern view of the world – a largely static, local, rural, and religious culture of English villages – even though their lives had been transformed by urbanisation, industrialisation, wars and empire. The trajectory of reading is very different from the trajectory of writing. That’s a general finding, not just one specific to the Romantic period, and one that suggests that any attempts to relate writing to the effects of writing needs to take account of the time lags. What people read in this period had a lot to do with accessibility of books, didn’t it? Pricing was key. Wordsworth wasn’t prepared to sell his work cheaply and therefore wasn’t as widely read as he could have been. Is that correct? Yes, that is correct. Wordsworth’s books were mostly expensive and the numbers of copies sold was small. It took years to sell out an edition of 500 copies even with remaindering. The Excursion was one of the most expensive books for its size ever published. The retail price was equivalent to two or three weeks’ wages for a skilled manual worker. For the price of a single copy of The Excursion, when it was first published, you could buy more than 100 fat pigs. So Wordsworth’s works don’t really reach a middle class, let alone a mass readership until they came out of copyright towards the end of the 19th century. A lot of my book is about the book industry – the technology, the pricing and the copyright regimes that determine price. At first I only did that economic analysis as a way of getting at who had access to which texts at which time, a precondition for getting at potential effects. But strong patterns come out from that analysis of the book industry – notably the direct link between the changing copyright regime and price, and therefore access. Attempts to assess the effects of writings from a purely cultural point of view, without bringing in the conditions in which they were published, priced and circulated in material form are, in my view, methodologically incomplete. In the Romantic period, apart from word of mouth, ink on paper was the only way in which complex ideas could make their way across time and distance. Let’s turn to your first book, The Romantic Ideology, which calls for a radically revisionary reading of Romanticism. Please tell us more. I’ve chosen this book because, along with other essays by Jerome McGann, it does explain and consider what Romanticism is, and how it continued to influence our ways of thinking. Romanticism can be regarded as beginning as a movement in the later 18th century in Germany and going on until the mid-Victorian period. It has a number of components that don’t necessarily cohere. One is the rhetoric of individual genius, inspiration and creativity that takes it as given that the greatest authors and artists are able to declare truths that transcend their own times. Another is an emphasis on individual feeling that can be seen as a reaction to the mechanistic view of human nature that you get in the philosophical writings of the Enlightenment in the 18th century. A third was that individuals can learn timeless truths direct from looking at “nature”, such as the mountains and the forests, conceived of as unchanging and benevolent, without the hard grind of study and education. When, for example, Wordsworth claims that “One impulse from a vernal wood May teach you more of man, Of moral evil and of good, Than all the sages can”, we can surely now see that this is nonsense. It is not a perennial truth but a way of thinking common in Wordsworth’s day and earlier, but now of only historical interest – it is an error that has been superseded. What McGann says is that literary studies, and studies of Romanticism in particular, were prisoners of the phenomenon that they were allegedly studying. Such studies commonly talked about individual genius and about the meaning of the text as if that was fixed. They operated in a tradition of hermeneutics, which came from bible studies, that regards literary works as containing hidden truths that can be teased out by careful armchair study. Editors searched for the final intentions of the author as being the best guide to his best thought. In fact, as emerges from many empirical studies of how Romantic works actually came into being in the form that they did, many people besides the authors normally participated in the composition, production, presentation and dissemination, and printed texts were seldom stable. And besides being socially produced, they were also socially consumed, not only by being read aloud and talked about in drawing rooms and reading clubs, but by having been composed with the known preferences of readerships anticipated in the actual writing. I chose McGann because he rightly says we shouldn’t uncritically swallow Romanticism but should unpick its assumptions and study literature, and the effects of literature, just as we should study other phenomena, by standing outside and not inside the rhetorics. In that sense, your book is very much outside. My book is very much outside the rhetorics of Romanticism. A lot of books nowadays claim to stand outside these rhetorics. There is nothing wrong with studying and celebrating the great authors, even when we cannot accept their worldview, and I am not advocating cultural relativism. Where the confusing error occurred was in thinking that studying the great authors in the “canon” takes us somehow to what actually happened in the past, or to the ways of thinking prevalent in the past. There is also another point I would like to make. We have a spate of books now which I call “in the imagination” books, where the author, rightly distrustful of taking the great canonical authors as representative of an age, makes his or her anthology of non-canonical texts. So a scholar might bring together a piece of political writing, a play, a long-forgotten novel written by a woman and a book of advice on children’s education, that were all produced at much the same time, and the author then makes remarks about them and the “imagination” of the society from which they emanated. This kind of study is, frankly, quite easy to do in the age of on-line texts, but I’m very sceptical about the methodology or the general usefulness of what they can tell us, given that there is an infinitude of texts from which such anthologies can be compiled and an infinitude of criteria for making the selections. What claim can such texts have to represent the “imagination” of an age? These studies appear to me to be a residue of the romantic notion that texts deserve to be scrutinised without paying regard to the material conditions under which they were produced and read, or the many alternative texts that their readers, if there were any, had access to, and may have been influenced by. — and then try telling me this is not an exciting time for audiencing/reception studies we’re going through. These are the tools that now allow us to look, archaeologically, into past reception practices in all sorts of media (film, television, radio, etc.) that once were “new”. Revient sur 2 figures des Payne Fund Studies : Frederick Thrasher et Paul Cressey. Les deux sont des diplômés de l’université de Chicago où l’influence de Münsterberg est importante dans les cours de sociologie, notamment sa conclusion en 1916 sur le pouvoir de suggestion du cinéma (pas forcément en mal d’ailleurs). L’école de sociologie de Chicago regarde le domaine urbain à la recherche des “zones intersticielles” = zones qui échappent à l’organisation sociale. Puisque dans cette vue darwinienne le changement social est dû à un processus de croissance où la désorganisation est nécessaire à l’organisation sociale. D’où l’étude des zones désorganisées: danses, cinéma, quartiers pauvres, etc. Alors que leurs études (notamment Cressley) montrent une remarquable capacité à se noyer dans l’anonymat des foules et à reprendre les concepts fournis par leur observation, l’objectif reste néanmoins didactique et normatif : comment réglementer ce qui ne l’est pas encore. Ainsi ces études créent l’expert en études des média (media expert) : celui qui aura analysé la “situation totale” empiriquement et sera donc l’autorité en vue d’une réforme. Reste que ces sociologues sont les premiers à ancrer le cinéma dans les études universitaires (cours de Thrasher à NYU en 35-36), même si leur voie (sociologique) va être rapidement oubliée au profit d’études textuelles du cinéma. Larry LANGMAN, American Film Cycles: The Silent Era. Greenwood Publishing Group, Westport (CT), 1998, 400 pages. Près de 1000 films muets, de 1900 à 1929, en 2 époques (1900-1919 et 1920-1929), par thèmes et genres. Pour chaque thème, Langman présente chronologiquement plusieurs films, en indiquant surtout acteurs, metteur en scène, et résumé de l’intrigue en lien avec le thème en question. Quelques indications sur la réception des films. Les informations de contexte restent assez générales. Notamment les chapitres se lancent directement dans une présentation des films les uns à la suite des autres, sans introduction plus précise pour replacer le contexte: ces films étaient-ils populaires ? Pourquoi avoir choisi ces exemples et pas d’autres ? Avec un corpus certes plus restreint, Kevin Bronwlow (The War, The West and the Wilderness ou Behind the Mask of Innocence) propose une contextualisation autrement riche en informations. Reste très intéressant pour faire sortir de l’oubli des films, et d’une manière générale faire revivre la diversité des sujets et les généalogies des thématiques. Référence à consulter. McNAMARA Brooks: “Scene design: 1876-1965: Ibsen, Chekhov, Strindberg.” Drama Review. 13 no. 2, hiver 1968: 77-91. Essai visuel sur tracant l’évolution du décor de scène réaliste depuis la fin du 19è siècle, dans les mises en scène des pièces d’Ibsen, Chekhov ou Strindberg. – la question de la “simplicité” apparaît en creux dans ses discussions: si une sélection d’objets apparaît nécessaire pour éviter la surcharge décorative ou symbolique, trop de sélection peut rendre le décor banal. Ainsi certaines productions du mouvement New Stagecraft, dont les espaces apparaissent trop généraux. Simplicité, mais aussi précision des détails et des espaces. En liaison avec la tendance symboliste, cette simplification du décor réaliste conduit au “réalisme modifié”, où l’objet réel, signe d’environnement précis, le dispute aux formes exaggérées de l’expressionisme. L’article est cité notamment dans Bordwell et al., The Classical Hollywood Cinema dans “The Hollywood mode of production to 1930” (p. 147) où Janet Staiger étudie en détail l’organisation et la division du travail dans le studio hollywoodien, notamment l’apparition du titre de “technical manager” ou “technical director” dans les équipes de production, suite à l’importation du décor en trois dimensions du théâtre du début du siècle. Staiger recommande également Brander MATTHEWS, A Book about the Theater (New York: Charles Scribner’s Sons, 1916). You are currently browsing the book reviews category at flycz.